The Firefox web browser supported profiles for a very long time. Profiles are separate browsing profiles that run independent of each other. User generated content, bookmarks, installed add-ons, or the browsing history is kept separate from other profiles, and so are settings, custom about:config modifications, or any other change made to the browser. 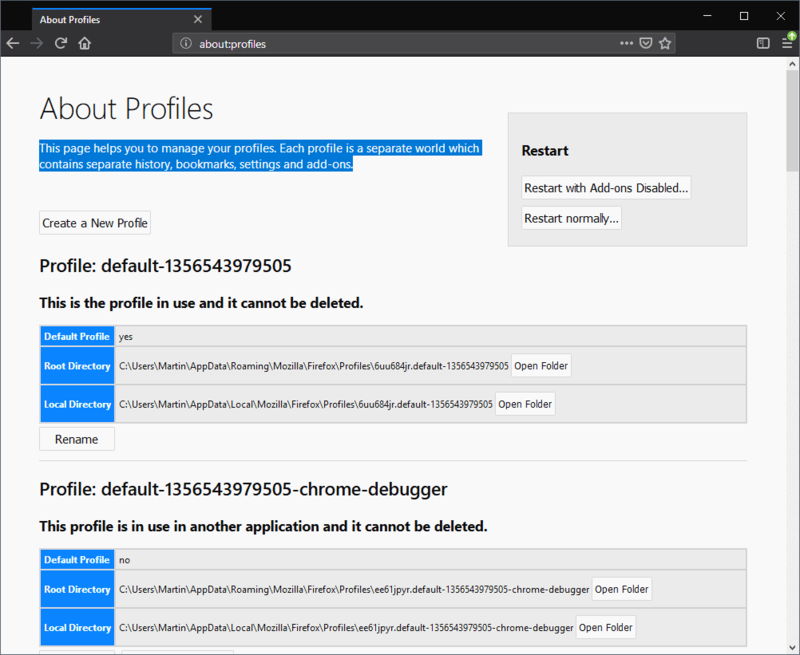 Firefox users and admins used the Profile Manager to create new user profiles and manage existing ones in the past (and still do as it still works fine). You can check out our Firefox command line options overview for details on running the Profile Manager; essentially, you have to add -p when you start Firefox to have it launch the profile manager, and need to add -no-remote to the command if you want to run multiple profiles at the same time. I run multiple Firefox profiles for work and for specific tasks as profiles offer a better way of separating data and customizing the browser to different requirements. Mozilla planned to replace the original Profile Manager with a new tool back in 2011 but nothing came out of that even though it is still possible to download the new tool the organization created back then and run it. The organization did introduce the about:profiles internal page in Firefox in 2015 to move profile management into the browser. The about:profiles page is available in all supported versions of the Firefox browser. You can load the address in Firefox Stable or Firefox Nightly. Create a new user profile. Restart the Firefox browser with add-ons disabled. Restart options are self-explanatory; Firefox launches a profile creation wizard when you select the create new user profile option on the page. 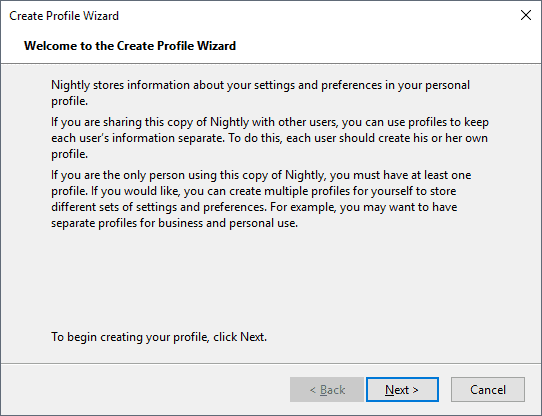 The wizard walks you through the steps of creating a new profile in Firefox. You may select a custom name for the profile and even change the default folder if you want to. The profile is ready for use right after you hit the finish button to create it. You find the list of existing profiles below the three general options. Each profile is listed with its root directory and local directory, and whether it is the default profile of the browser. The default profile gets loaded automatically when you don't supply other instructions on start. Rename -- always available. Renames the profile name. Open Folder -- always available. Opens the folder of the profile in the default file browser of the operating system. Remove -- only available for non-default and not in use profiles. Deletes the entire profile. There is no backup but Firefox displays a prompt that requires confirmation and explains that the data cannot be restored once the user gives the okay. Set as default profile -- only available to profiles that are not the default. Changes the default Firefox profile to the selected one. Launch profile in new browser (Firefox 63) -- Opens a Firefox instance using the selected profile. Some of the options are really useful. Rename may come in handy if you did not pick a custom name for a profile, and remove helps you clean up profiles. The option to launch a profile in a new browser is new and useful if you need to run a profile in a new browser instance next to the existing one. Note that the profile will open in the same Firefox version which may not always be what you want. Tip: I have created desktop shortcuts to load profiles and different versions of Firefox with just a click. Now You: Do you use multiple profiles in Firefox or other browsers (if supported)? The guide takes a detailed look at the about:profiles page of the Firefox browser which provides tools to manage browser profiles. Previous Post: « Is Mozilla's new DNS feature really dangerous? Only one Firefox profile here, no use either of the container feature nor of private browsing. Cache, data, cookies are managed rigorously. I have but one browser policy and according settings which are as tight as can be which means that more profiles would mean only lesser tight settings, not harder. Yes, I use different profiles too and I also start FF with shortcuts. It is a good way to have all tools I need for my customer in one profile, so I don´t accidently work with the false configuration. The “Profiles” management method of Mozilla product is very convenient because it can prepare arbitrary variations, and it is one reason why you like Mozilla product. I create them in a given Folder (C: \ Users \ xxxxxx \ AppData \ Roaming \) and Backup (Copy & Paste) to local. Save the Bookmark in the Folder of Local and share the file between the Browser (Firefox, SeaMonkey, Waterfox, PaleMoon, Brave, Vivaldi, Iridium). That folder is backed up (Sync) to cloud storage (SpiderOAK, Box). I never have, no. The utility they provide isn’t useful to me. When I studied Firefox in order to switch to it as my main browser (which it still is), I had two thoughts : this ability to use several profiles is incredibly powerful and useful, and the way it’s implemented is a crying shame. Everything in the way of creating, naming, renaming, backing up, deleting profiles, finding them within the file system or switching from one to the other is counter-intuitive and dangerous. For instance, I don’t accept the default way of Firefox to automatically name profiles. I think it’s retarded and I use my own. I tried using for a while this add-on, software, thing that was especially devoted to managing profiles. That could have been the solution. Then I learned it was abandonware. Now I use this thing, object, beast or whatever, that everytime I launch Firefox, opens a box and asks me what profile I want to use. This is in spite of the fact I practically always use the same. Why ? Because dealing with a single one is already hell. This “thing” is only here to remind me that profiles do exist, and to offer me a visible entry point into them. Because, If I had not set up Firefox to launch this, ahem, blob of something or other, there would not even be any obvious sign that something called profiles exists in Firefox. Let alone hint at how to use them. Now I have just learned that a third way of getting into profiles has been invented (when ? ), and that’s an “about” page. OK, that is relativealy easy to remember. Can that about:profiles thing do better than, or at least as well as the other “thing” I have been using up to know, I cannot tell. You will have noticed by now that I haven’t used the proper name for those various “things”, because I forgot them a long while ago. Here goes another sure sign that the whole profiles management is a mess. Mozilla’s raging leftists have been so busy pulling the rug under us every other day, moving the chairs around and forcing us to constantly learn new ways of doing things that were perfectly all right until they broke them, that I haven’t been able to really put profiles to good use. So colour me skeptical while I still have to deal with the after-effects of the Quantum apocalypse, and I even have to contemplate buying twice as much memory, just in order to avoid the last versions of Firefox from freezing my computer periodically. Forget about learning to use several profiles at the same time. By the way, does anybody know whether there still is an official portable version of Firefox ? I just installed Portable Apps’ version out of desperation, and it seems not to have the memory hogging problems of the regular, installed version. It does seem, though, to be an up-to-date version, compatible with current extensions. Is that a proper way to use the browser ? Any opinions on portable Firefox ? I only use one profile. However, I read recently that if I want to use Firefox for the i2p router app then it is best to create a new profile for that purpose. I too have created a shortcut for my profile folder to my desktop. But I moved the shortcut to my startup folder for easy access from the start menu. This makes it easy for me to delete files for privacy and security from my profile folder and my cache profile tucked away within the local folder. I was also using CCleaner’s custom files and folder option to make this chore easier, but have since moved to Bleachbit for the same purpose. Yes, I have 8 Profiles on my main PC (default, IT-related, media-related, personal, etc.). I got sick of wading through 1000’s of bookmarks and the huge number of them seemed to bog FF down. When I transferred to Pale Moon (2013?) “I took my Profiles with me”. I have set up my other PC so that it can also share those Profiles.